Tellers of Weird Tales: Who Was Arthur Pendragon? The other day I wrote about C. Hall Thompson, who contributed Lovecraftian pastiches to Weird Tales in the 1940s. I also wrote that there is at least one person who speculates that Thompson was the man behind two stories by a pseudonymous author dubbed Arthur Pendragon, published in Fantastic Stories of the Imagination in 1964-1965. I say pseudonymous, but I don't think anyone can say for sure that Pendragon wasn't his real name. It just seems really unlikely that it was. His (or her) two stories in Fantastic were "The Dunstable Horror" from April 1964 and "The Crib of Hell" from May 1965. The story goes that in the 1940s August Derleth threatened C. Hall Thompson with legal action if Thompson didn't stop writing Lovecraftian tales. I don't know the source of the claim of Derleth's threatened action against Thompson, but it doesn't sound out of character for him. As the learned Darrell Schweitzer points out, Pendragon's secret identity was most likely Arthur Porges, who wrote for the magazine under his own (noticeably similar) name during the same period. Sounds good to me. In other words, there isn't any good evidence one way or another. There is of course circumstantial evidence that C. Hall Thompson was our man. After having written pulp stories--mostly Westerns but also a few weird tales and crime/detective stories--in the 1940s and '50s, Thompson may have gone looking for other markets in the early 1960s. Could he have dusted off a couple of old Lovecraftian pastiches and submitted them to Cele Goldsmith, editor of Fantastic, either under a pseudonym or insisting on a pseudonym so as to avoid any trouble with Derleth? Maybe so. Ms. Goldsmith and Derleth would seem to have been connected in one way or another. Whether distantly or closely, I can't say, but maybe she would have understood the problem--and looked right past it because of her endless need for new material. Or maybe Derleth's ire against other Lovecraftian authors of the late 1940s had died down by the early 1960s. The circle of Lovecraftian authors, editors, artists, and fans could not have been very big in any case. Artist Lee Brown Coye was working for both Cele Goldsmith and August Derleth during the early 1960s. 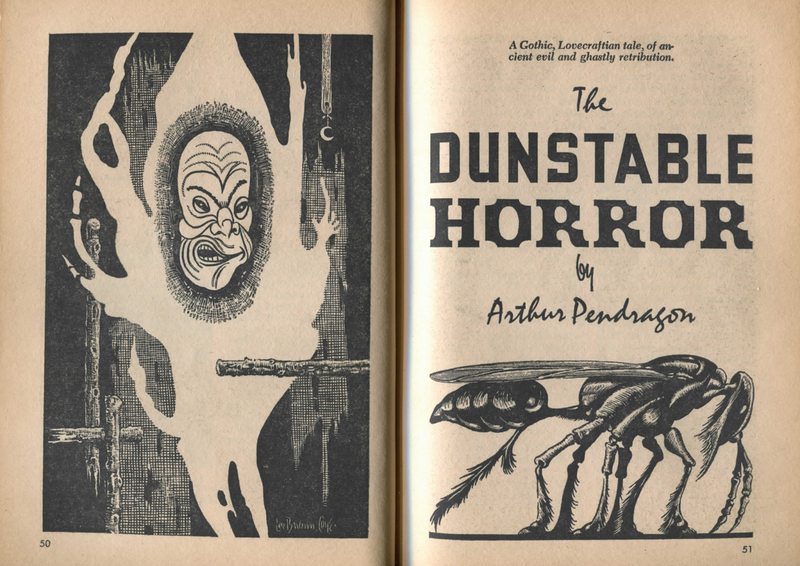 He in fact illustrated "The Dunstable Horror." Maybe that's connection enough. Nevertheless, Cele Goldsmith bought and published two Lovecraftian stories from a now unknown author, despite any objection Derleth might have had. There is also circumstantial evidence that Arthur Porges was Arthur Pendragon. The first name and both initials match, and it was a pretty common practice for writers of science fiction and fantasy to write under more than one byline, especially for different kinds of stories. One possible weakness in this argument is this question: Did Porges write other Lovecraftian pastiches? Is he known to have been a fan or reader of Lovecraft's work? If he wasn't, then it's harder to believe that he wrote what some consider to be among the better Lovecraftian tales from after Lovecraft's death. Witness the inclusion of both of Pendragon's stories in Acolytes of Cthulhu and Mr. Price's comment in his introduction that Pendragon's "reputation is narrower than it ought to be." None of that is a problem, of course, when it comes to C. Hall Thompson. He had written Lovecraftian stories before and there isn't any reason to think that he couldn't have done it again in the 1960s, alternatively, that he had been sitting on those stories since the 1940s and got them into print when the opportunity presented itself. So who was Arthur Porges? Well, he was the son of James and Clara (Kurzin) Porges, two Jewish-Russian immigrants who came to the United States as young children in the period 1888-1890, spoke Yiddish as their mother tongue, and lived in the Chicago area for most of their lives. James Porges was born Israel Podgursky but changed his surname to match that of a relative in Chicago. Arthur was the second youngest of James and Clara Porges' four sons. His older brother Irwin (1909-1998), a college professor and musician, wrote Edgar Rice Burroughs: The Man Who Created Tarzan (1975). (Burroughs was also a Chicagoan.) The youngest of the Porges boys, Walter Porges (1918-1979), was a teacher of history in Connecticut and at Pierce College in Los Angeles. It seems as though at least three out of the four ended up in California. Arthur Porges was born in 1915, served in the U.S. Army during World War II, and taught college-level mathematics. According to the Internet Speculative Fiction Database, his first published story was "The Rats," which appeared in The Magazine of Fantasy and Science Fiction in December 1951. He published dozens more stories until his death in 2006 at age ninety. In looking over their titles, I don't see any that jumps out as a possible Lovecraftian tale, but you never know. I'm not sure that it matters anyway, for the question of who Arthur Pendragon really was will remain until someone finds a telltale typescript or letter or some other piece of evidence among the papers of a deceased author or editor. By the way, Arthur Porges was born on August 20, 1915, H.P. Lovecraft's twenty-fifth birthday. 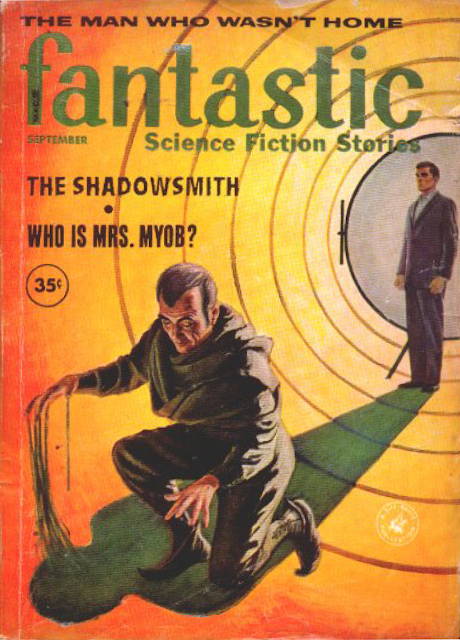 Arthur Porges had the cover story, "The Shadowsmith," in the September 1960 issue of Fantastic Science Fiction Stories. The cover artist was John Duillo (1928-2003), later the other Conan artist for Lancer Books. 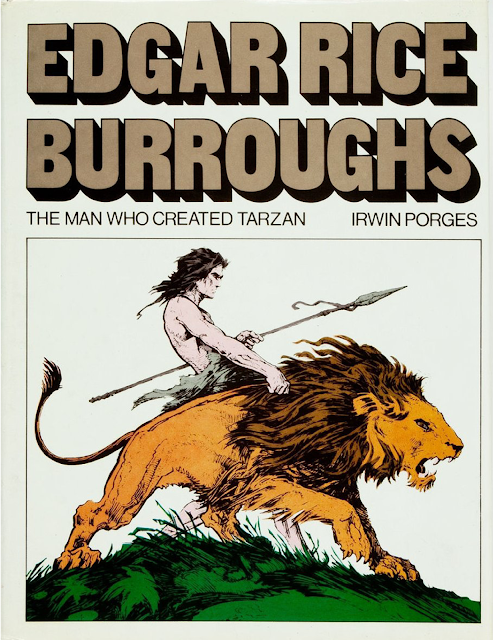 Arthur Porges' older brother, Irwin Porges, was also a writer and the author of the book Edgar Rice Burroughs: The Man Who Created Tarzan (1975). He and Arthur also collaborated on a story called "A Touch of Sun" for Fantastic, published in the issue of April 1959. The cover artist here is unknown. Both Irwin and Arthur Porges were of an age to have grown up reading Burroughs' stories. Irwin Porges reached the Golden Age of Science Fiction (which is twelve) in 1921, Arthur in 1927. Burroughs must have captured their imaginations. But what about H.P. Lovecraft? Would they have had the same reaction to his work, assuming they read it? It's impossible to say. But maybe generations matter when it comes to these things. C. Hall Thompson was younger than the Porges brothers by a decade or more. Born in 1923, he would have lived his formative years in a time when Weird Tales and H.P. Lovecraft (as well as Amazing Stories and other science fiction pulps) were at their peak. Could Lovecraft have been his Burroughs? Again, it's impossible to say. Both C. Hall Thompson and Arthur Porges have been proposed as the true identity of the (presumably) pseudonymous author Arthur Pendragon. Pendragon has two genre-fiction credits. First came "The Dunstable Horror" in Fantastic Stories of Imagination, in April 1964. The illustrations were by Lee Brown Coye, his last work for the magazine. For the next several years, Coye did illustrations for August Derleth's Arkham House. Like Derleth's 1945 pastiche The Lurker at the Treshold, "The Dunstable Horror" is set in rural New England. Also like Derleth's novel, there is an element of the plot that involves an American Indian of unusual power. 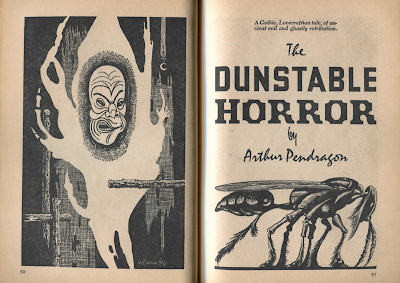 If C. Hall Thompson was Arthur Pendragon, and if he wrote "The Dunstable Horror" in the 1940s, he or his editor may have felt that his story was uncomfortably close to The Lurker at the Threshold. (Lovecraft's village of Dunwich makes its appearance in Derleth's book, too.) Maybe he didn't want to risk a lawsuit. On the other hand, maybe Thompson--if he was Pendragon and if Derleth had made legal threats against him in the 1940s--couldn't pass up the chance to stick his finger in Derleth's eye after so many years and so submitted his tale to Fantastic. But that's all a lot of speculation. The mystery remains. Labels: August Derleth, C. Hall Thompson, H.P. Lovecraft, Jewish Authors, Lee Brown Coye, Who Was . . . ? In the late 60s the owner of Harvey's Bookland, a used book store in Lowell, MA, told me that he had a customer the other week who had published some stories under the name Arthur Pendragon. This makes me doubt that Pendragon was Porges because surely Porges would have mentioned his own name and writing credits. I've always considered Pendragon to be a one-off (actually two-off) anonymous writer. It makes sense that Pendragon was based in New England. Then again, if you love Lovecraft and are imitating Lovecraft, then you're likely to set your stories where Lovecraft set his. I'm willing to consider that C. Hall Thompson, Arthur Porges, or even Joe Shlabotnik was the author of the Pendragon stories as long as there is evidence to support that assertion. Now you have the first piece of evidence of anything, assuming everybody involved was telling the truth. Unfortunately, that piece of evidence doesn't get us very far.